Gwadar is situated on the shores of the Arabian Sea near the key shipping routes for two-thirds of the world oil supply, it is in Pakistan’s western province of Baluchistan. It is almost 533 km from Karachi and 120 km from Iran’s border and 380 km northeast to the nearest point in Oman across the Arabian Sea. Gwadar Port is located near the key shipping routes in the Persian Gulf. It is situated on the eastern bay of a hammerhead-shaped Peninsula projecting into the Arabian Sea from the coastline. Currently, Pakistan has two main operating international sea ports: Karachi Port and Port Qasim. Their expansion programs are unlikely to keep pace with the expected growth in future, resulting in a utter need for a third port to fill the gap. Particularly, Karachi Port has serious physical limitations and will not be able to flourish at the same speed as the national growth in demand over the coming years. These restrictions arises mainly from its location, which is inside the city of Karachi itself. Whereas Port Qasim, although having a large physical space for expansion, but its possible speed of development is obstruct by its upstream location, which is more than 40 km far from the open sea, resulting in long turnabout times for arriving ships. This is not a difficulty for cargoes that are located close to the port, but it carries cost disadvantages for cargoes that have extractions and destinations elsewhere. Against this background, it was deemed timely to construct and inaugurate a third deep-sea port for Pakistan so as to ensure that national development is not hampered by a lack of national port capacity in the future. Analyzing the expected rapid growth in demand for port capacity, it is important to continue expanding the capacity of Gwadar port over the coming decades. With co-operation with China, Once completed, the port, which is closed to the Strait of Hormuz (a key shipping lane that serves as a gateway for two-third of the world’s traded oil) is seen to be an initiatory of energy and trade corridor from the Gulf, across all over Pakistan to western China, and could serve as possible Chinese naval base in the Arabian Sea. 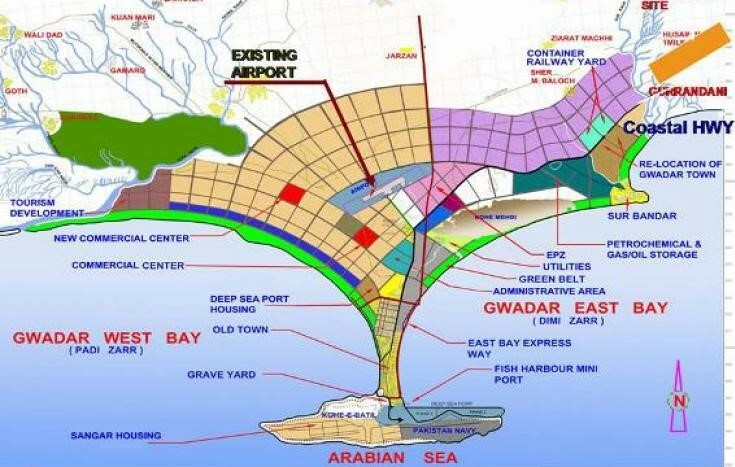 The entire Gwadar project has been handed over to a Chinese company named “kingdom construction” with all the port’s mobile and immobile, afloat and ashore assets, framework, groundwork and systems. There will be freedom on import duties and sales tax on all imports for materials, machinery, extension and running of port for 40 years. There will be immunity from corporate income tax, stamp duties, duties on loans acquired, sales tax, all provincial and local taxes and levies for 20 years. Another delegation of senior Chinese officials visited Gwadar with an offer of setting up a steel mill there. It was pointed out that Chinese government has planned to build an international airport in Gwadar and a power generation plant, along with other facilities like expos, hotels and restaurants. Last year, just 2.99 million metric tons of business was managed through Gwadar port as compared to 64.57 million metric tons from Karachi port and 41.44 million metric tons from Port Qasim. Gwadar port is expected to become functional by May this year. The following year, Kazakhstan Chamber of Commerce and Industry indicate their interest to set up wheat grain silos at the Gwadar port. Indeed Gwadar is one of the biggest project of Pakistan’s history which will create jobs opportunity and solve power issues as well as strengthens economy of the country. Worriedly India as counter to China’s presence in the region, declared that it will reform Iran’s critical Chabahar port that provides a passage route to land-locked Afghanistan. The port, which is enclosed by a free trade zone, is decisive particularly since Pakistan does not allow any transit operation from India to Afghanistan. Remember, Chabahar port is just 76 kilometers away from the Gwadar port.